I saw the HoodiePillow Pillowcase pitched on ABC’s Shark Tank last Friday and thought the idea of a hood built into a pillow was a pretty silly idea. I still do. But the same company has another product that isn’t so silly and one that I would even use. It’s their Travel HoodiePillow. It’s a drawstring hood built into an inflatable neck pillow. Available in Grey or Black, the Travel HoodiePillow supports your neck and provides privacy while you’re trying to sleep on a plane, train, etc. The HoodiePillow Pillowcase is available now for $19.95. Pre-orders for the Travel HoodiePillow are currently being accepted. They are priced at $16.95 and will ship in April. I.saw the same episode. I too think the pillow is ridiculous. 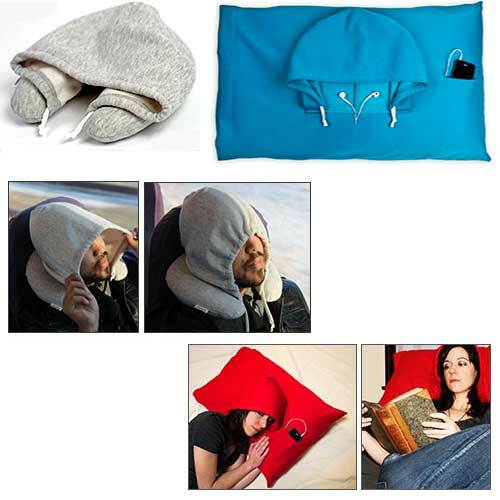 The hoodie neck pillow seems interesting but I don’t see it selling to more than an initial spurt. What kind of privacy can you get with this? Your face is still mostly exposed. Inflatable pillows are the last choice next to memory foam or beads. I think they are both losers.